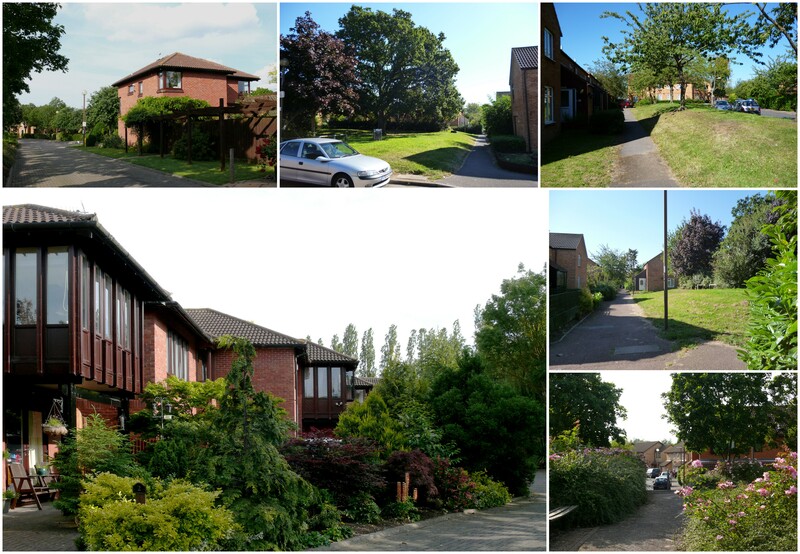 Wayland Tunley intentions from the start were to have a wide variety of uses and housing on this site as he saw the dangers in housing 3000 people in a repetitive layout lacking amusement and joy. A clearly understood street, cycleway and pedestrian network were to lead to a lively central area to be shared with the adjacent grid of Pennyland and to be linked to the city via the grid road. He intended to provide maximum variety of public areas surrounded by house types and designs which people were familiar with and liked. 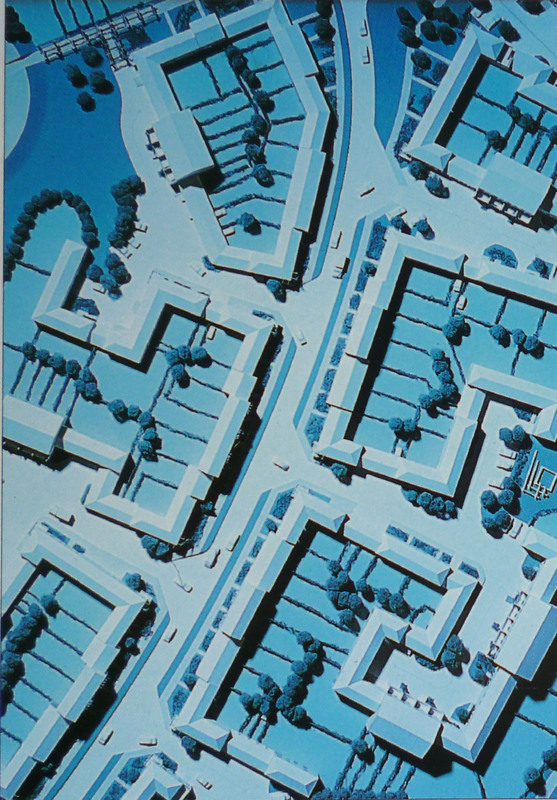 The layout consisted of varied building designs around streets, mews, landscape styles, offering surprises and vistas. A wide variety of mostly wide fronted one to three storey houses was employed often placing living rooms on first floor to take full advantage of the views. Most of the houses were originally meant for rent, some for sale. There was also specialist accommodation for Spastics Association, employment office, shops, a Pub, health centre, housing for elderly, schools. 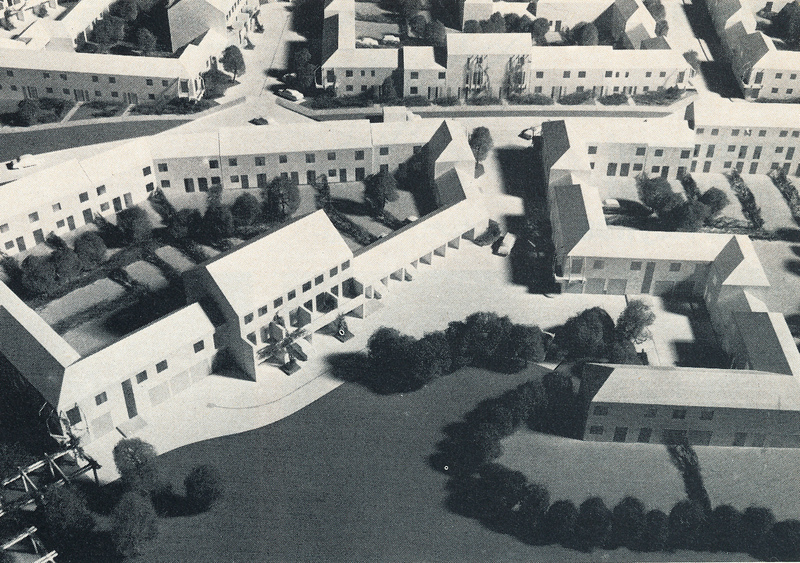 This variety building types was fully utilised to provide variation of scale and roof heights. 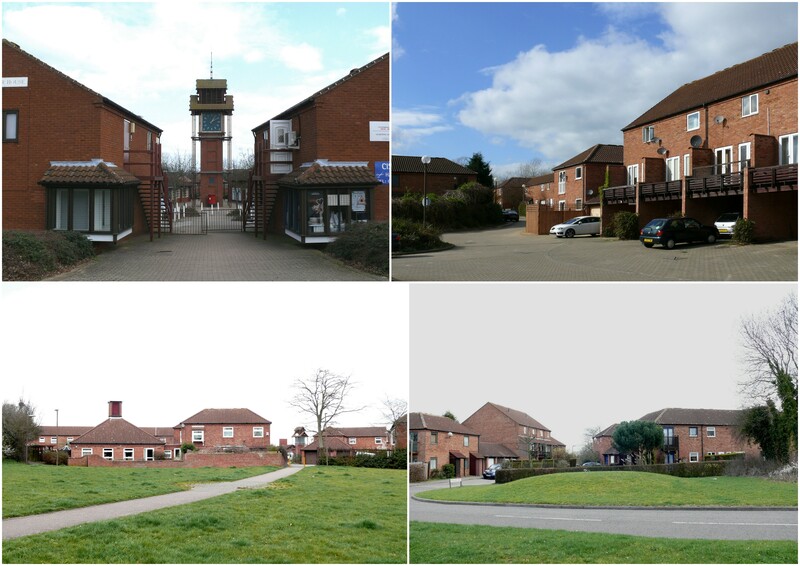 The streets and mews are named after old crafts, within context of a ‘village vernacular’ of a comprehensive newly designed picturesque village community lost within a modern large new city designed for cars. The local centre lies within Neath Hill but casts its visual net to cover the adjacent grid of Pennyland and indeed announcing itself to the speeding motorists on the main grid road. 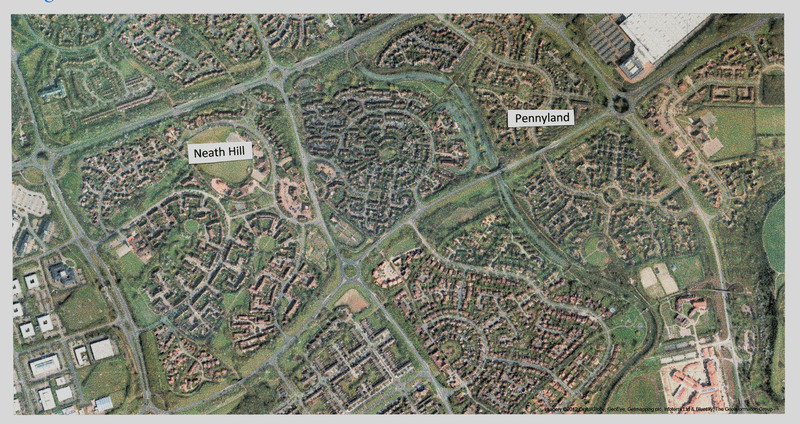 Neath Hill and Pennyland are special grids as the local centre shared by the two adjacent areas is a departure from norm and addresses the main grid road to break the MK planning rule of hiding the centres in the heart of grids surrounded by housing and a lush belt of hedges and trees to keep the housing grids secret and private to the local population. Wayland Tunley is the main ‘conductor and composer’ in this area. The housing varies from simple and plain to celebratory and elaborate, depending on the placement within a very rich mix of public spaces and pedestrian circulation. 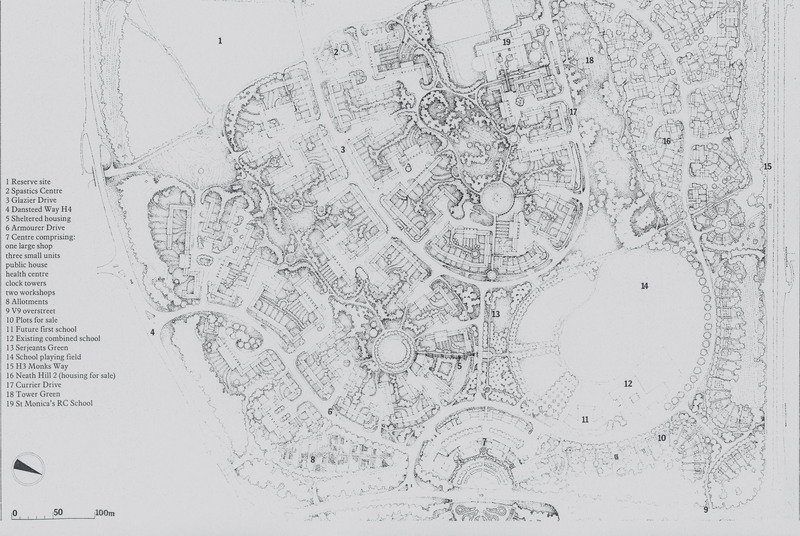 The hidden secret of these grids lies in the joy of walking on footpaths winding their way through matured landscape reminding you of intimate country lanes, village greens, with beautifully framed views of building landmarks. Grand Union Canal has also been included in giving an extra boost to this subtle experiencing of marriage between the social architecture and the best traditions of British informal landscaping by offering a mini ‘Venetian Corner’ with a British twist to the complete surprise of casual newcomers. By the time Pennyland come to the drawing board, the energy conservation was becoming a significant issue. The first phase was built to higher standards if insulation and employed quite a few energy conservation experiments and studies. 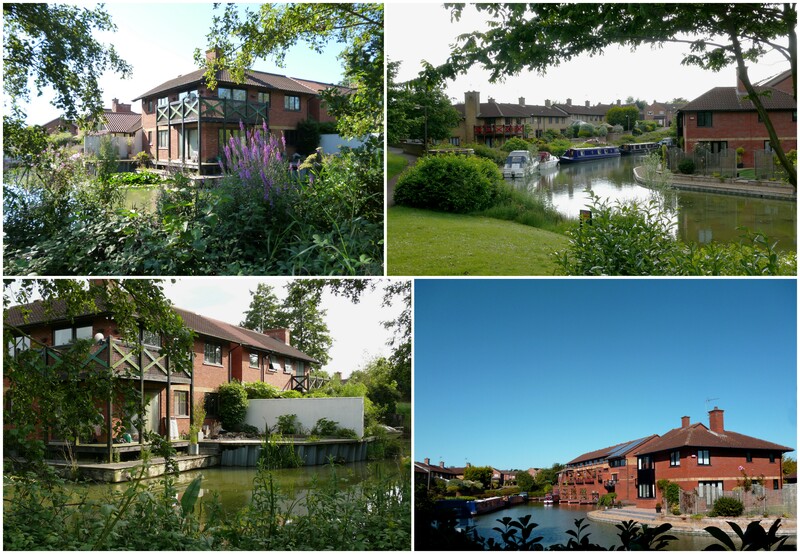 Wayland Tunley left MKDC in early 1980s and won a competition to build canal-side housing (I assume as a builder/developer partnership) which used traditional canal side architecture and language of Netherfield very effectively. 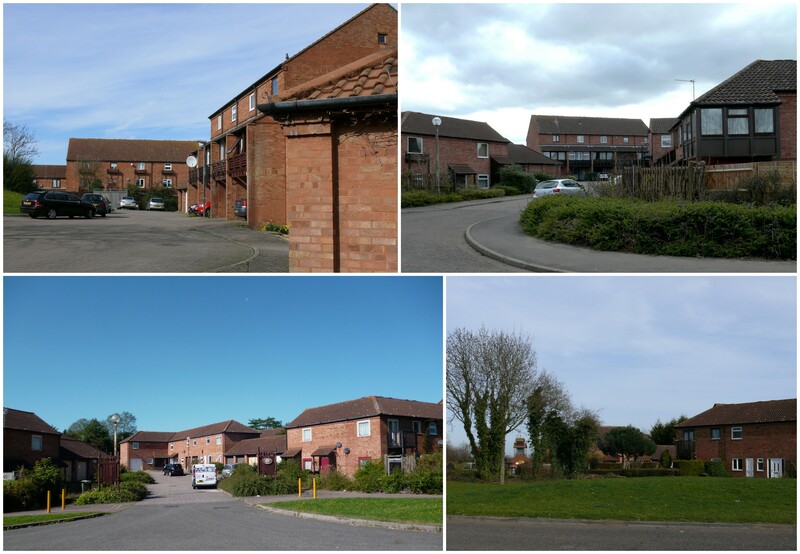 Housing built further away from Neatherfield was carried out by other architects and developers. Tim Skelton and I am preparing what we hope will be the definitive list of the modern architecture of MK: would you be interested in contributing to it? Hello Robert, I hope you are well. I am afraid I try to keep myself free from too many tasks these days. If I can be of some limited help I wouldn’t mind. « Galley Hill, Greenleys. Early Housing in northern Milton Keynes.